I quite possibly have the heart of a child. I love anything remotely tacky, colourful or generally aimed at children. This being said, my latest purchase can only be described as rather childish. I absolutely adore children’s fiction and love the art of illustration, combining my love of both: cue Charlie and Lola. I’m a little bit lost in this one, and when I stumbled upon these adorable gifts in The Works bookshop, I just couldn’t quite resist. The 4 piece Breakfast Set is pretty quirky and perfect for little tummies. My porcelain plate and mug have found a home in my craft room, storing trinkets and keepsakes. The bowl and egg cup however have rightfully found a place in my kitchen- where they belong. Here’s hoping for an egg and soldiers breakfast sometime soon. 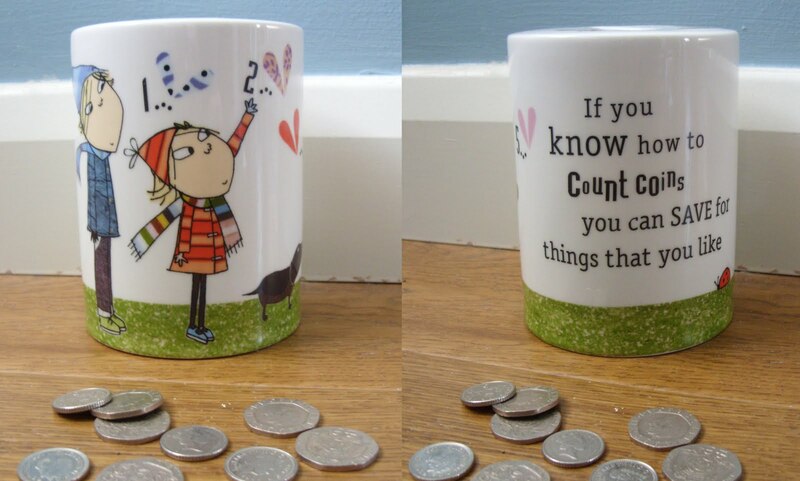 My other purchase was this cutesy Money Box, typically whimsical and perfect for rainy day funds. I love the text; it’s full of charm and character. These little treats have ignited my love for Charlie and Lola that little bit more. I know these would make the perfect gifts for children and anybody with a similar love of all things cute. OMG I want want want NEED the breakfast set! There's something so appealing about kiddie breakfast sets, isn't there? There was a penguin one in the supermarket the other day and I was *so* close to buying it, despite the fact that the house already has more crockery than there is room for. Haha, awww, this is adorable! cute, cute, cute buys!! charlie and lola are just soo darn cute! i too am young at heart, always wanted to be a child, still reading children's books and loveeee cute and childish things hehe..